As we move through the hiring process and prepare contracts for each company member, we ask the essential question, Why should we hire you for a job in the opera company? This question serves to enlighten and inform our decisions as to whom will be best suited as electricians, performers, composers, writers, public relations officers, costume and makeup designers, set designers, stage manager and production manager. Where do we see the most interest? In which job will the student grow most? What skills and abilities does the student exhibit that will contribute to the collaborative work of the specific job group? Individual student interviews not only give children an authentic experience as eight year olds, but also a sneak preview of what to expect as adults in the work world. In order to truly take off our masks, we first need to design and make a physical representation of our metaphors. Nina Muys, retired art teacher, led the company in a session of mask making that taught not only the artistic process of creating an actual mask, but also the care and respect the artist must give his subject. 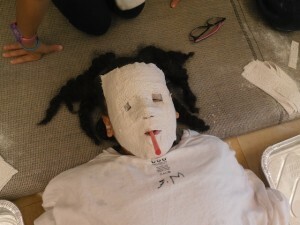 Company members carefully prepared short strips of plastic craft and gently placed the wet strips on their partners’ faces to create the perfect shape, texture and mold. The manner in which students demonstrated care and concern for one another was absolutely beautiful. Each made his partner feel comfortable and secure in the process. As the masks hardened, company members delighted in the ceremonial removing of the masks. Though we had a clear plan, improved communication and the will to persevere, our second attempt to defeat the Magic Carpet Challenge was not successful. The company experienced a host of emotions during the sixty minute session. Did we fail or just not finish? The written reflections expressed deep, thought provoking thoughts and feelings that will carry us into our next challenge. Jamoya emphatically stated, “I’m not going to let this barrier block me.” None of us will, Jamoya. When first we broke into groups of three to discuss the central message of our opera, Andrew, Beki and Josúe seemed a bit uncomfortable as they attempted to communicate. Neither Beki nor Josúe has a command of the English language. In fact, Josúe arrived from El Salvador in August speaking no English at all. Beki had a head start on understanding as she arrived in the United States late last school year. As other groups conversed and time passed, the three began determining a way to convey their ideas to the company. Beki and Josúe offered Spanish verbs indicating ways to confront or move past barriers. They charted their ideas in Spanish on large paper. They then showed Andrew the meaning of these words through gesture. As Andrew understood, he shared and wrote the English translation. How ironic that they were actually doing that which they were trying to articulate in words. What is important to us? About what do we care profoundly? The mask has served us well in digging deeply to uncover and discover our fears, our hopes and our vision for ourselves in the future. What am I hiding behind the mask? What am I hiding from? When do I put on my mask? When and for whom do I take it off? What does my mask represent? In responding to these questions, company members were able to identify and analyze individual behaviors and habits. Our actions and behaviors are motivated by external and internal ideas and perceptions that drive us to do the things we do. When we are conscious of our motivation for acting, we can then think about altering those behaviors we know are counterproductive to our well-being and to the well-being of others. Company members generated a collective list of things that hold them back and keep them from showing their true selves. “Where am I? I feel scared. I’m confused. 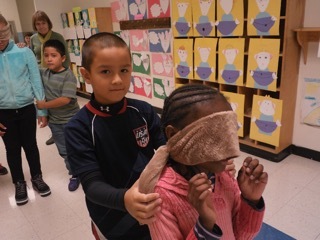 I’m going to fall.” These words were common among members of Take Off the Mask Kids Opera Company as they were blindfolded and led by a partner through the hallways of the school. Up and down stairwells they proceeded with great trepidation and anxiety. Each took turns being leader and follower. What was learned during this one-hour exercise could not be replicated or simulated by a textbook or curriculum guide. Effective communication, trust in self and others, consciousness of self and surroundings, risk taking, cooperation and patience were applied in an authentic context as students moved cautiously from one floor to another with their classmates. What is a logo? Why is it important to a company? What does it represent? These questions we pondered as we thought about our company name, Take Off the Mask Kids Opera Company. Each student drew a pictorial representation of our company name and composed a written defense proving its potential and significance in representing who we are. Watching students prepare and verbally practice their defenses was intriguing. They were clearly engaged in the process and motivated to persuade their audience. We are Take Off the Mask Kids Opera Company. 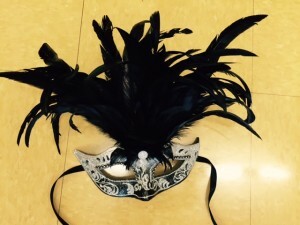 On the first day of school when the class was presented with the mask and I asked, “How will the mask help in our learning this year?” Jasmine G suggested a powerful metaphor that has informed our instruction and our decisions as a company ever since. In thinking about who we are and whom we represent, Jasmine also offered a new word she had encountered in song lyrics. After reading The Music Inside Me, a book written by fourth graders in Massachusetts, my students pondered their music within. They drew pictures. I asked if they wanted to represent these drawings with music. A collective yes resounded. We gathered in the music room, surrounded by an assortment of instruments. Bells, glockenspiels, xylophones and recorders waited to be played. Each student selected his instrument of choice and the exploration in composition began. It was fascinating to watch the creative process in action. For most, it was a first experience. The time came to share the musical masterpieces with the class. Many seemed nervous as they joined their circle of fellow musicians. As they played, one after the other, the room filled with possibility, joy and accomplishment.